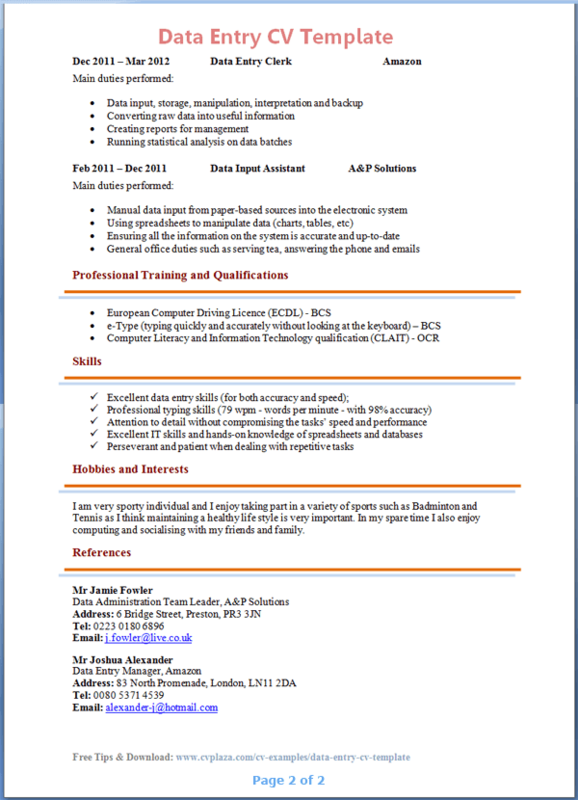 Tip: Use the Data Entry CV Template below as an example to help you write your own personal and fully-tailored CV. I am a hard-working, methodical and driven individual with more than three years of experience in the Data Entry field and with the ability to input and manage data accurately, with great speed and in high volumes. I am able to demonstrate effective communication and organisational skills; work on my own initiative, both independently and within a team. I have the excellent ability to organise and prioritise my workload to achieve set goals and deadlines in the most efficient manner. I am a very sporty individual, and I enjoy taking part in a variety of sports such as Badminton and Tennis as I think maintaining a healthy lifestyle is very important. In my spare time, I also enjoy computing and socialising with my friends and family. Research: The first thing that you need to do is to research the job role properly before you can start writing your CV or even considering to apply for the job. Having a read through the National Careers Service’s Data Entry Clerk job description is a good starting point. Working in the data entry field can be extremely repetitive and tedious at times, and it is highly recommended that you convey the message that you are an all-rounded person who also has a good personal life besides work. This will reassure the prospective employers that you have a healthy and balanced lifestyle which is critical to high performance and productivity. 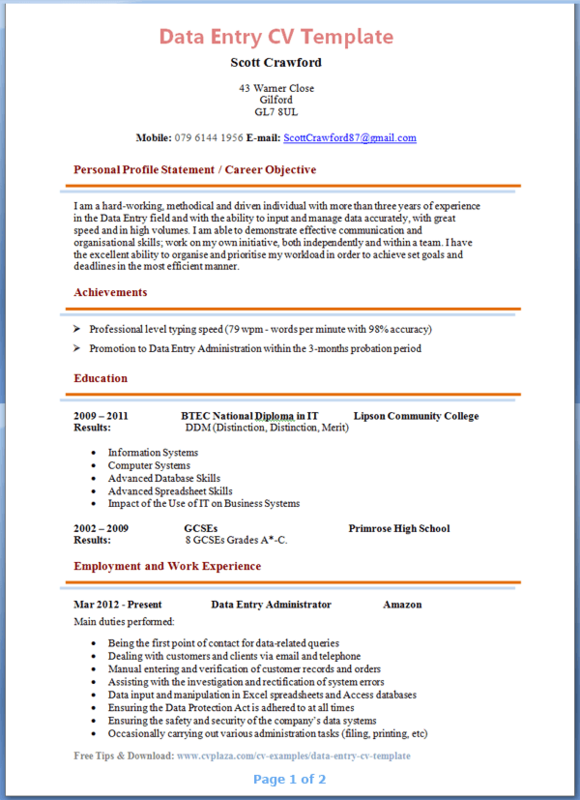 CV with No Experience: The good news is that most data entry jobs do not require you to have prior work experience although you will be expected to be computer literate. If, however, the job vacancy specifies that previous work experience is required you may want to use your College/University projects as examples where you did data inputting, manipulation and presentation. Make your CV results-oriented because, at the end of the day, you will be judged on the results you deliver not about how fast your data inputting skills are. Demonstrate this by real-world examples where possible.